With years of experience in what it takes to deliver content online, Page Mountain provides a structure to maximize your site’s uptime and ensure it’s integrity through redundant backups and monitors as well as integrate your email and document management needs. Your site’s pages and static images are cached all over the planet so when a user anywhere in the world asks for your site, it comes from the server nearest to them as much as possible. In addition, when your site is on the Page Mountain network it is automatically maximized for the speediest scripting and image delivery. 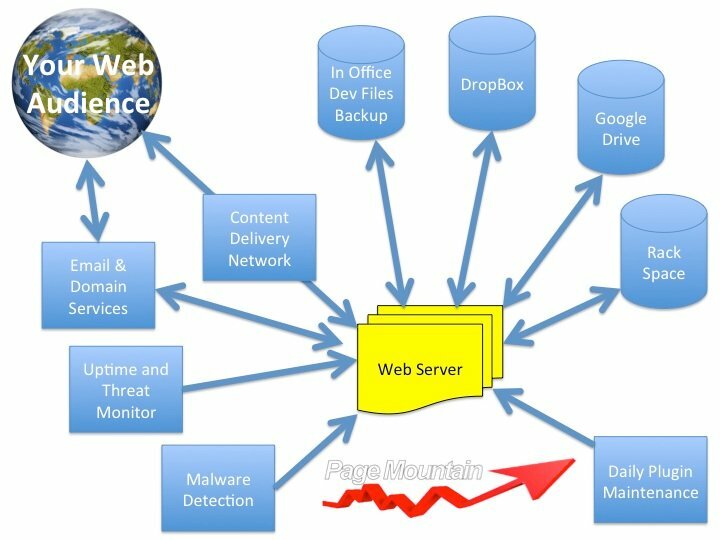 And this first bastion of defense, also uses a common pool of known threat sources, your site is protected from attack. Each day and once per week, every site on the Page Mountain servers is backed to at least two locations in two different formats. In addition, the entire server is backed up daily, weekly and monthly. If you wish, you can also participate in the backup scheme with a DropBox account, the daily backup can be shared so it also echoes to your own onsite storage. These backups contain all system files, images and the database of the website. Because Page Mountain specializes in the WordPress Content Management System, all sites are monitored through a central system on a daily basis. Third party plugins are one of the benefits of the WordPress environment, but that also can mean updates to its architecture can be a daily event. The same system monitors revision history, system overhead and spam commenting. Because threats to a web site present on a daily and weekly basis, Page Mountain monitors all web site – from within the web site itself – as well as from the outside, for known attack patterns and threats. Every few hours, each site is scanned for problems and alerts go out to the server administrator. Also, the processes – both the server itself and the database activity, are monitored by third parties soley dedicated to reports on performance. Page Mountain also offers the most up to date Email and Domain services. From registering your domain and ensuring it is properly maintained to offering simple email services or enterprise Microsoft Exchange services (including mobile autosync) and automatic email archiving, Page Mountain can offer a full service online presence for your company.